Name descriptive of location and contents: Encephaloceles in general present with extracranial herniation of brain tissue, leptomeninges, and/or CSF through a defect in the skull or cervical spine. They are typically named according to the anatomical location of the bony defect. If only meninges and CSF herniate through the defect, it is called a meningocele. 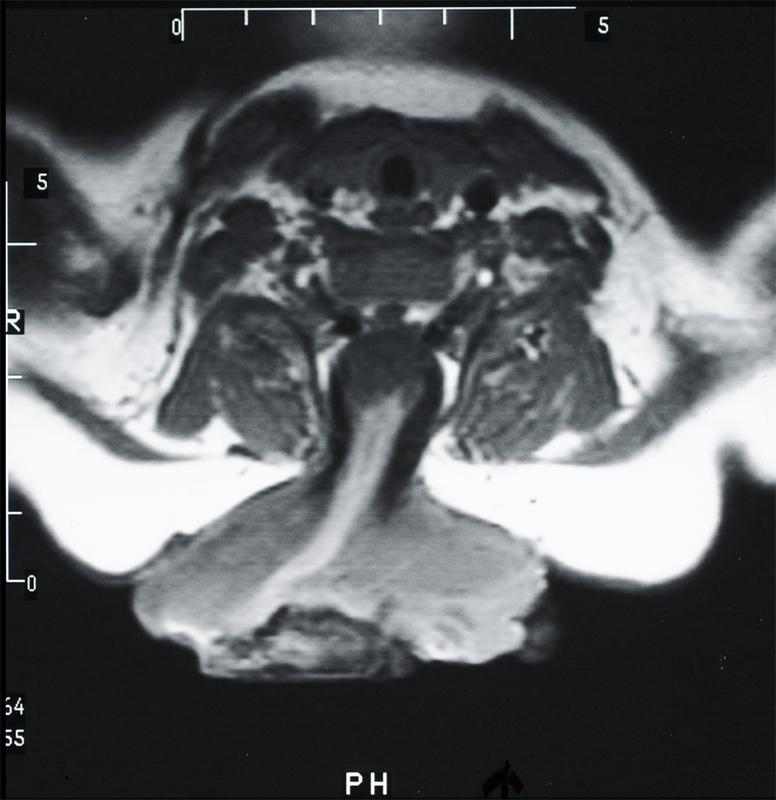 Midline fusion defect: Cervical encephaloceles result from herniation of neural tissue through a fusion defect in the posterior aspect of the cervical spine. Axial T1-weighted MRI of cervical encephalocele: A midline mesodermal fusion defect with herniation of neural tissue is present. These deformities are extremely rare, with very few patients reported in the literature. As such, the natural history of cervical encephaloceles remains unknown. Neurulation abnormality: Failure of the surface ectoderm to separate from the neurectoderm during neurulation is believed to be the cause of encephalocele formation. Cause unknown: Although encephaloceles are commonly grouped together with anencephaly and spina bifida as neural tube defects with similar origins, the exact mechanisms underlying their development are still unknown. Not related to folic acid: Since it is unclear whether the mechanisms underlying encephalocele formation are similar to those underlying anencephaly and spina bifida, it is also unclear whether folic acid supplementation has an effect in preventing encephaloceles similar to its effect in preventing anencephaly and spina bifida (4, 15, 16). The prevalence of encephaloceles in some populations has not significantly declined even after increased maternal intake of folic acid (17-19). Size varies: Cervical encephaloceles may range in size from quite small (e.g., 1–2 cm in diameter) to larger than the infant’s head. Contents vary: The contents of the encephalocele sac are highly variable and may include cerebral cortex, cerebellum, brainstem, thalami, and/or ventricular structures. Associated abnormalities: Multiple intracranial abnormalities have been reported in patients with encephaloceles including kinking/distortion of the brainstem; posterocaudal shifting of intracranial contents; distension of the ventricular system, optic pathways, corpus callosum, and hypothalamus; inversion of the cerebellum; dysgenesis of the vermis; dysplasia of the corpus callosum, and hydrocephalus (1).